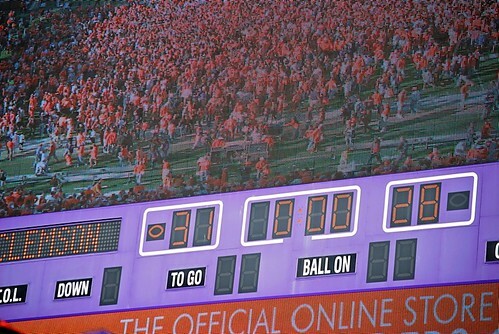 Clemson Girl: Can a football game really take 10 years off of your life? 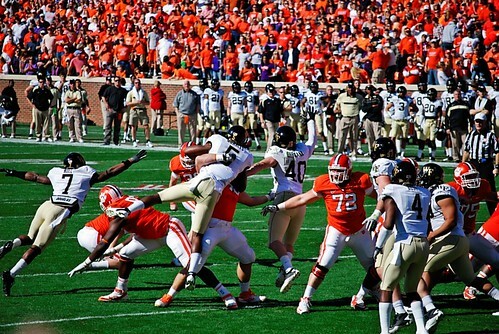 Clemson vs. Wake Forest game recap. Can a football game really take 10 years off of your life? Clemson vs. Wake Forest game recap. If it can, 75,000 Clemson fans in Death Valley and the thousands watching at home can expect a shortened life span after watching the Tigers thrilling 31-28 ACC division clinching win over Wake Forest Saturday. After having a 14-7 half time lead, the Tigers allowed Wake Forest to score 21 unanswered points in the third quarter before getting things clicking on offense and defense. Deacons Michael Campanaro returned a 50-yard punt for a touchdown. On the next Clemson possession, running back Andre Ellington fumbled the ball setting up a 19-yard touchdown run by Wake Forest’s Brandon Pendergrass giving the Deacs their first lead of the day at 21-14. Quarterback Tajh Boyd was intercepted on the next possession and again it was Pendergrass with a 33-yard run stretching the Deacon’s lead to 28-14. Boyd redeemed himself the next time the Tigers got the ball going 5-for-5, marching the Clemson offense 68-yards down the field on a drive that culminated with a seven-yard catch by Brandon Ford. The Tigers tied the game at 28-28 on Jaron Brown’s 10-yard touchdown catch with just over five minutes remaining in the game. The Clemson defense seemingly struggled all day because of Wake Forest quarterback Tanner Price’s quick, accurate throws, but they dug down deep and forced Wake Forest into a quick three-and-out. But Clemson’s ensuing possession ended with a 30-yard field goal miss by Chandler Catanzaro. The Deacons again took over and after a quick first down, they had the ball at their own 38 yard line. The Clemson defense again bowed up, forcing Price into two incomplete passes and a huge sack caused by seniors Rennie Moore and Brandon Thompson. The Clemson offense took over with less than a minute remaining. Tajh Boyd was on top of his game hitting Dwayne Allen on two passes for 33 yards. He then found Adam Humphries- who was playing for an injured Sammy Watkins- for an eight-yard pass down the sideline which set up Catanzaro’s heroics. Catanzaro got his redemption for missing the earlier field goal by drilling the 43-yarder just as time expired. This was a game of redemption. Redemption for the offense. Redemption for the defense. Redemption for Catanzaro. Redemption for a team that finished 6-7 a year ago.